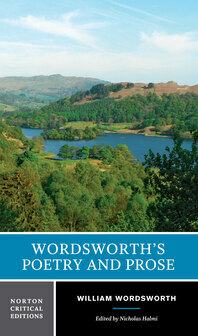 This volume is the first to present Wordsworth's great poem in all three of its forms. It reprints, on facing pages, the version of The Prelude that was completed in 1805, together with the much-revised work published after the poets death in 1850. In addition, the editors include the two-part version of the poem, composed in 1798-99. Each of these poems possesses distinctive qualities and values; to read them together provides an incomparable chance to observe a great poet composing and re-composing, throughout a long life, his major work. The most accessible edition of Wordsworth’s poetry and prose, prepared to meet the needs of both students and scholars. This Norton Critical Edition presents a generous selection of William Wordworth’s poetry (including the thirteen-book Prelude of 1805) and prose works along with supporting materials for in-depth study. Together, the Norton Critical Editions of Wordsworth’s Poetry and Prose and The Prelude: 1799, 1805, 1850 are the essential texts for studying this author. Wordsworth’s Poetry and Prose includes a large selection of texts chronologically arranged, thereby allowing readers to trace the author’s evolving interests and ideas. An insightful general introduction and textual introduction precede the texts, each of which is fully annotated. Illustrative materials include maps, manuscript pages, and title pages. “Criticism” collects thirty responses to Wordsworth’s poetry and prose spanning three centuries by British and American authors. Contributors include Samuel Taylor Coleridge, Percy Bysshe Shelley, Felicia Hemans, Ralph Waldo Emerson, Lucy Newlyn, Stephen Gill, Neil Fraistat, Mary Jacobus, Nicholas Roe, M. H. Abrams, Karen Swann, Michael O’Neill, and Geoffrey Hartman, among others. The volume also includes a Chronology, a Biographical Register, a Selected Bibliography, and an Index of Titles and First Lines of Poems.